The series, Disappeared: How Border-Enforcement Agencies Are Fueling a Missing-Persons Crisis, focuses on three different Border Patrol practices that increase the likelihood of someone dying or disappearing while crossing the border. 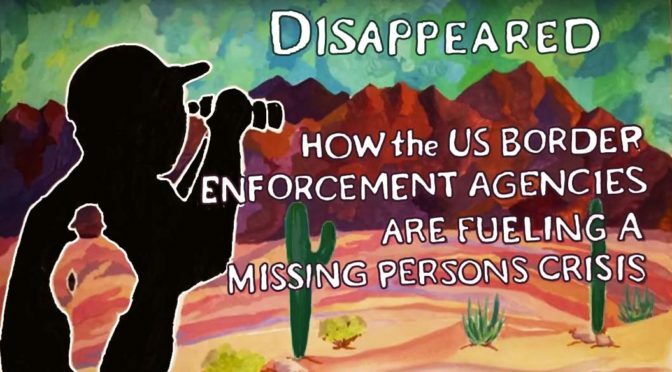 Part 1, Deadly Apprehension Methods, documents how Border Patrol agents chase groups and individuals causing them to scatter in remote terrain, where these border crossers are more likely to become lost, injured, or to disappear. Send your faxes with one click, and use the numbers below to leave a message for each of these legislators. Hi, my name is _____________, and I’m calling to urge Senator __________ to delay the building of a border wall under Trump’s administration. Please stand up for border communities and the rights of migrants by commissioning a GAO report on the cost of Trump’s wall, and by making a commitment that you will filibuster any bill that includes Trump’s wall or other border infrastructure that will push migration into deadly corridors. Home > Abuse documentation > End the crisis of death and disappearance at the border!